I think broad beans are worth having just for the plants alone. I love their winter flowering that has a tiny pink blush on the petals (like they have been stained with raspberry juice), and their slightly fragrant flowers looking like butterflies clustered on a stick. And then you get the edible pods!NOTE: To encourage ‘bushiness’ pinch out the tips when they are about 1m high – you can eat those too in salads. 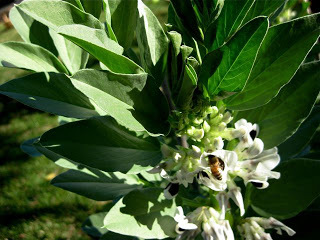 Growing Broad Beans (Vicia faba): Known as fava beans in America these are one of the easiest beans to grow. 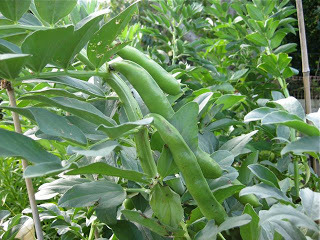 They are not a summer bean however, and need to be planted late summer for spring harvesting – but they are frost hardy. Sow the seeds in a bed that has been enriched with some good compost/composted manure/ or composted grass clippings. 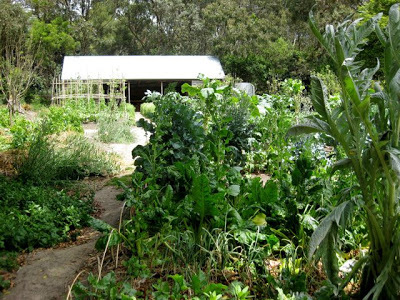 Give it a feed of blood and bone and dolomite (to raise the pH slightly as the pea and bean family prefer slightly more alkaline soil)- 1 handful of each per square metre. Water well until the shoots are through and about 15cm high – you can then pretty much leave them alone unless you have a very dry period. Plant a few together so that they can support each other as they get taller. Broad beans are a favourite vegetable of mine with their nutty flavour, but I learned even more about them on my last trip to Sydney thanks to my Greek friend Despina. The Greeks have a whole repertoire of cooking broad beans at every stage of their development, and I was lucky enough to get some dishes cooked for me or have the recipes passed on. The shelled beans are delicious by themselves as a vegetable – simply steamed and tossed with olive oil, lemon juice and salt and pepper – but here are examples of the three ways to use them. ‘String’ the bean pods with a peeler as you would for runner beans. 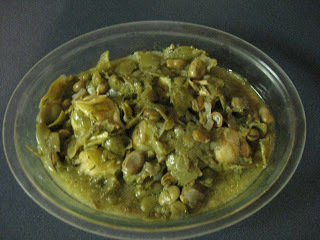 Add the broad beans and prepared artichoke with 1 cup of water and the chopped dill. Cook for about 20 mins adding the salt and pepper and lemon juice at the end. NOTE: You can also cook the whole broad beans like this, but without the artichoke and use stock instead of water – just don’t forget the lemon juice, olive oil and dill. 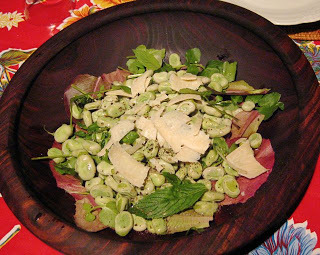 Salad of Broad Beans with Cauliflower, Watercress and toasted macadamia nuts. This is one of the best late winter salads that you will ever eat! When the pods are really fat and the skin on the beans is as thick as paper. Steam the beans for a few minutes until just cooked. Cool. Now, I am sorry but you are going to have to peel them or they give the dip a bitter taste, but it is worth it. Don’t worry if some are a bit grey looking. Mash the beans and add the lemon juice, crushed garlic and olive oil (about 1 part lemon juice to 2 parts oil). Add salt and pepper to taste. Should be firm, not sloppy. Spread on the crusty bread and open a bottle of prosecco. Buon appetito. (When I said to Despina “How can you eat the broad beans whole-aren’t they all hairy inside?” She replied “You think I would eat furry?”) NOTE: The furriness goes when you cook them. 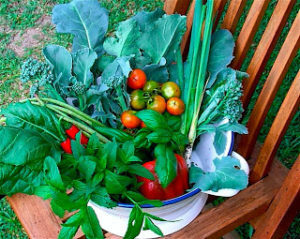 This was truly delicious – and all the better if you have fresh beans from the garden!